from 40 pcs. 0,25 EUR ea. from 80 pcs. 0,22 EUR ea. from 160 pcs. 0,20 EUR ea. 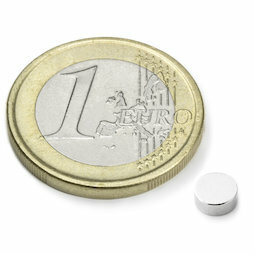 A small rod magnet that looks just like S-05-02-N52N, just with a weaker magnetisation (N40 instead of N52). Hence, it's adhesive force is "only" 520 g.
10 pcs. 0,28 EUR ea. 1 pc. 6,23 EUR ea. 1 pc. 20,42 EUR ea.